Day 2 dawned hot again, but there are storm clouds brewing to the west. What will the evening bring? Overall: M1 up, M2 over, M3 up. W1 over, W2 up-and-over, W3 over. M3: up. A rapid close on Press 7 as boat 2, and the bump was concluded on First Post. Relaxed mayhem cold describe the short and fast bump we achieved. Today’s crew included Ondrej and Mike Prior-Jones in place of Stuart and Will. It was Ondrej’s first bumps and what a row he had! A great start left the crew behind with nothing to chase and we swiftly gained on the crew ahead - gaining our first whistle in a twenty or so strokes. The rating didn’t drop much below the start of 41, even as we hit choppy water and a few duff strokes messed with the balance. At one point a single whistle could be hear for the X-Press 7 (Mills & Reeve) boat ahead - suggesting they were gaining on the Cantabs 11 in front of them. This gave us a momentary scare but we were reassured immediately as two whistles sounded for us, swiftly followed by three. As we hit first post corner we hit the crew ahead and that was it - a bump in front of the pavilions and willow for all. Barney’s proud parents were there to cheer for him and Lorraine got the foliage for us. A quick stop at the beer tree was mandatory. So - day three holds the tantalising promise of becoming the sandwich boat. Whoop. Tabs three put up more of a fight than Nines two: perhaps they knew we are fast and so sprinted. But despite another good start we didn't get our first whistle until half way down FP reach, and I was starting to wonder what was happening. Nonetheless we kept going - we are capable of getting at least to FP in good form - and got two whistles on FP; after that they perhaps tired because we closed to three in the gut and overlap and then the bump on Grassy. Which is excellent because someone must have videoed us from the bank. Bumping too early is bad from a photographic viewpoint. Feast yourself on the exciting bowcam video. ground. They stayed within a length but were unable to make up the distance by the end of the course. Coming out of Ditton Corner they definitely looked the stronger crew so should have confidence to bump tomorrow. Bumped Champs 6 at grassy taking them up to Sandwich boat but were unable to Bump the pesky Robs juniors to secure a position in Div 2. Sandwich boat tomorrow. W2 hold it up the ladies way. had a good start but not with the same dynamism as yesterday, we stayed with them but over the course but they gradually stretched the lead. We took it all the way to the Top Finish only winding down as they crossed the line. 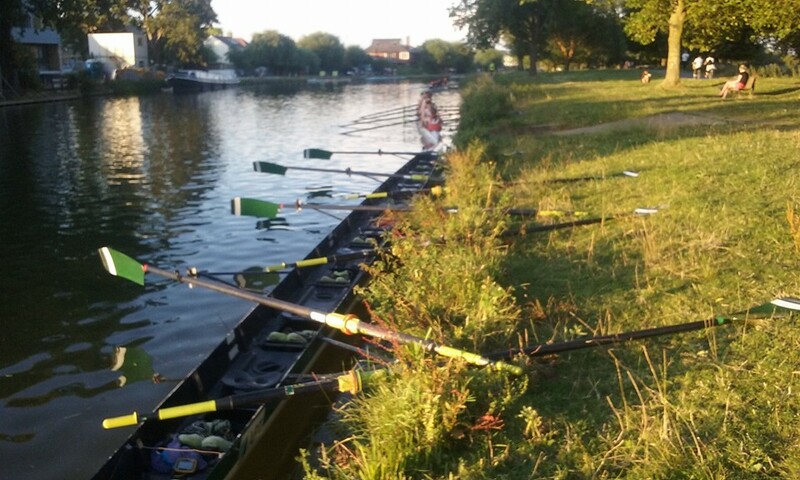 Cambridge News: "Chesterton mowed down Cantabs III on Grassy Corner" and "In women's Division Three, Chesterton, stroked by Meg Richard, bumped Champs VI to climb into sandwich boat position. They then chased Rob Roy's juniors, stroked by Freya Sutcliffe, all the way over the course in their second row, finishing just a quarter of a length behind at the line."